A State MP paid a whistlestop visit to the South Burnett on Saturday to announce a major upgrade to Cherbourg’s recycling centre. The annual production capacity of Cherbourg’s recycling facility is set to more than treble thanks to funding from Round 4 of the State Government’s Building our Regions (BoR) program. Stage 4 of the project will receive $999,297 from BoR, with Cherbourg Council contributing $15,000. Dr Anthony Lynham, the “Ministerial Champion” for Cherbourg, said lifting annual production capacity from about 3500 tonnes to 10,000 tonnes would reduce the load on overburdened regional landfills and also create jobs. “Three jobs (will) be supported during construction, while four ongoing jobs will be created once the project is complete. 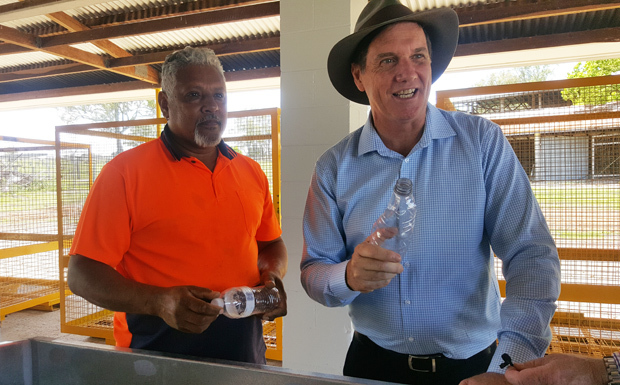 “The Cherbourg material recovery facility is the first of its kind in an Indigenous community in the country, helping to manage waste as a resource while reducing landfill waste. Cherbourg Arnold Murray welcomed the new funding. “This upgrade of the plant will enable us to meet contractual arrangements with Cleanaway, and to continue expanding into additional revenue streams like the Container Refund Scheme,” Mayor Murray said.